The process has acquired a new meaning with the advent of commercial ‘aquaponics’, which uses the goodness of water used by fish to grow crops, primarily green leafy vegetables. The method is simple. A large tank is filled with water. In this, fish are bred in adequate numbers. The water, which becomes rich in ammonia and other minerals over time from the waste discharged by fish, is then used to grow plants without any interference with soil in a controlled environment. After the nutrients are absorbed by the plants, the water is ploughed back into the fish tank. This is a continuous process that goes on uninterrupted 24X7. The fish, harvested after every six to nine months, make for an interesting by-product of this process, which also has a ready market and adds to revenue. “More than 95 per cent of the water is recycled through this process, while the earning comes from selling both, the fish and the vegetables grown purely in water,” says Anubhav Das, Founder and CEO, Red Otter Farms. Red Otter is a 10,000 square-foot pure aquaponics farm nestled in Nainital in Uttarakhand. Producing around 150 kilogram of green leafy vegetables such as lettuce, Swiss Chard, and Kale, among other plants per week, Das plans to expand the farm to 35,000 square feet soon. He says in some parts of the world people have started grown exotic veggies such as rosemary, pine, mint and even tomatoes through ‘aquaponics’. But while the technology has several advantages and could be a boon for an increasingly water-starved country like India, widespread commercialisation is constrained by its high cost. K Vijaykumar, Chief Executive Officer of one of India's first and largest aquaponics farms, Madhavi Farms, says that normally an average investment of at least Rs 2.5-3 crore per acre is required for setting up a proper commercial aquaponics farm. The cost might go down by 30-35 per cent if power supply is guaranteed 24x7, rendering investment in solar power redundant. A one-acre aquaponics unit needs about 600 units of power a day to run all the systems. Vijaykumar, who runs Madhavi Farms on the outskirts of Bengaluru, started operations in December 2017 and the first produce was sold in February 2018. 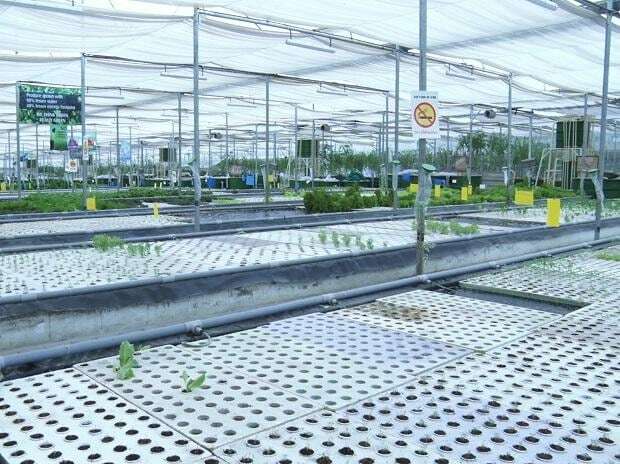 He said unless there is a regular and consistent market for products grown through aquaponics and there is demand from customers, such a large-scale investment is unviable. "We currently see demand only in the metros, where awareness and affluence supports organic products consumption," VijayKumar said. Madhavi Farms, set up in collaboration and technical support from Canadian aquaponics major, Water Farmers, covers a 60,000 square-foot area and is among the largest in the country. Vijaykumar says in a successful aquaponics farm only vegetables could be grown which aren’t readily available in the market and cater to a niche customer base -- those willing to pay more. This is because the investment to set up such a farm is huge. He says one needs to pick and choose an assortment of exotic varieties that can't be easily grown in open field cultivation -- given the challenging environment -- and plants that are indigenous substitutes for a variety of currently imported greens. “Commercial aquaponics is not for small and marginal farmers, as the investment is big, and you can’t grow crops using this technology that can’t be harvested daily and need to stored,” Vijaykumar says. Given a choice between spinach and green kale, a viable commercial aquaponics farm would typically grow the latter as it fetches Rs 200-300 per kg in the market as compared to just Rs 70 for spinach. It is precisely for this reason that over the last 18 months, Madhavi Farms has built a niche customer base primarily among urban buyers and daily sells all its harvests of exotic lettuces, Swiss chard and kale to five-star hotels and established retail chains such as Big Basket, Big Bazaar and Healthy Buddha. While Red Otter and Madhavi claim to be the two biggest commercial aquaponics farms in India, there are several others who use similar technologies like hydroponics to grow crops. Vijaykumar says though both hydroponics and aquaponics are soil-less cultivation processes, the former yields synthetic and inorganic produce, while the latter is 100 per cent Organic and natural. “Consumers and the markets are sometimes unaware of this principal difference. The most important facet of aquaponics is that it nature friendly, eco-supportive, energy saving, and leaves a minimal carbon footprint on the planet, and makes a world of difference when compared to any other form of cultivation,” he said. Reports say an experiment to grow potatoes through a form of hydroponics is being conducted in Central Potato Research Institute, Shimla. Aquaponics as a technology is best suited for dry and arid regions of the world where water conservation is high priority, but its growth and spread in India will take time unless the concept becomes commercially viable.